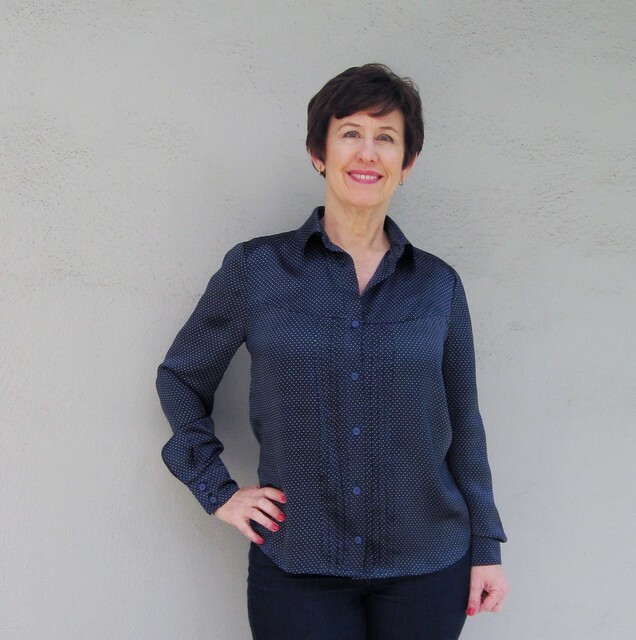 In keeping with my previously stated goal to blog and document my sewing projects, I am posting this blouse that I recently finished. Timely, as it is from the January 2018 issue of Burda. I posted a few pics on Insta and a number of people said they were interested to see it as it had caught their eye as well. Fair warning now - I've been really sick the past week, just feeling better in the last day or so but I jumped outside and took some rather sad photos via timer so I could do this post. I'm never motivated to take pictures this time of year, the garden looks scruffy, the light is meager and I just don't have that summer energy. But sewing continues so here goes. 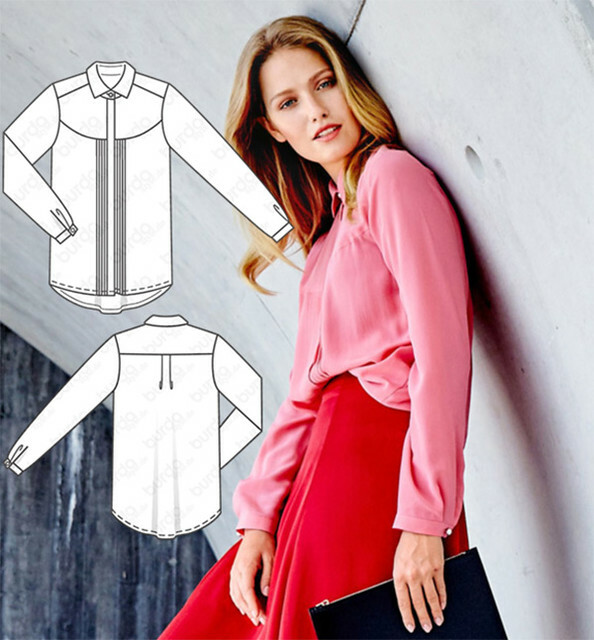 This blouse is all about the front details, the curved yoke and the pleated sections alongside the button placket. As I mentioned on Instagram, I made a pretty substantial error, which I attribute entirely to inscrutable Burda instructions. Also I'm not all that familiar with their style, and then I typically don't read or use any instructions unless there is a special detail that is not readily obvious how to do. So I did read over the instructions because I needed to see how the pleated parts worked. Spoiler: there is no pattern piece for the pleated sections, just a "cut two pieces of X dimensions, then mark stitch lines X width apart, sew pleats, then cut out the needed pattern piece from the pleated fabric using template" What? although I followed it in a very detailed fashion and it came out perfectly, so who am I to criticize? 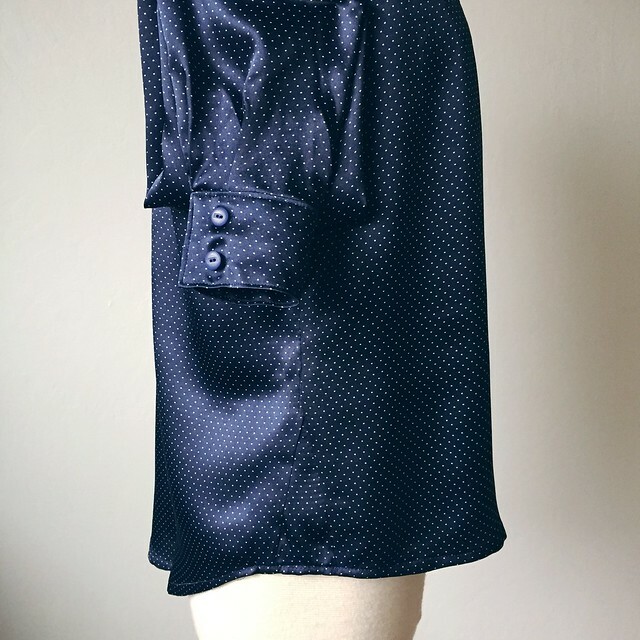 BUT - the big error came at the end when I just happened to look at the photo again to see where they placed the buttons, and realized that it was supposed to be a HIDDEN BUTTONHOLE placket. 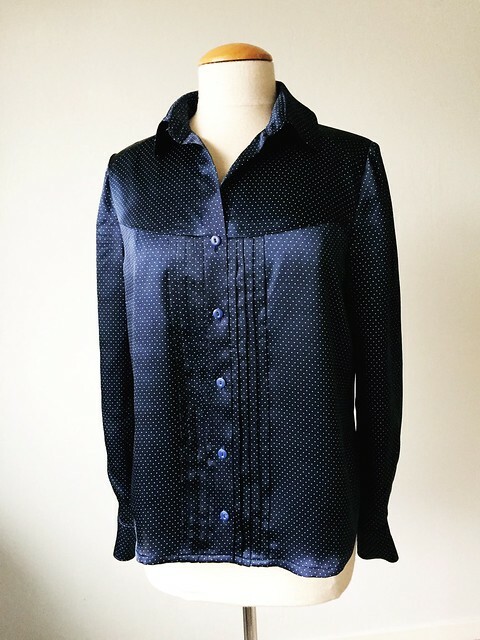 Which is a feature that I often add to silk blouses but did not seem apparent either in reading the directions or in the pattern pieces. So if anyone of you figures out that little detail I would be interested. But I think it would have added another layer of fabric in the seam along side the pleated section so not a problem that I missed it. Tech drawing and slouchy not useful photo of the blouse on a model. I think I lightened up this photo of the back view, which has accentuated the wrinkles. But it probably could do with a good press. Do you ever get less than motivated to press the back of things, knowing that as soon as you wear it either the wrinkles will fall out or new ones will develop as you sit down? Also when I put it on for the pictures I decided that the back is too long. I think I lengthened the whole thing with an idea to make it more tunic-y and flowy and then when hemming decided to make it regular shirt length, but the back is still longer and I need to go back and fix that. I did make a size 38 which is my usual size in Burda however I kind of forgot about adjusting at the hip area, usually I start with a 38 but for dresses I would grade out at the hip, adding 3 or 4 inches. But I was thinking loose shirt - no problem and didn't even think about checking the fit. And so I have this little correction. Yep, I had to add a little wedge at the side seam. To return the hip circumference to a nice amount of ease. 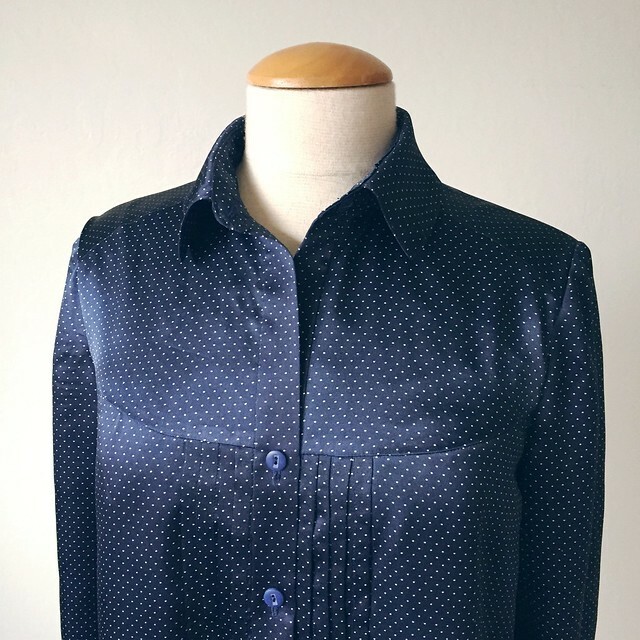 Without it I could have buttoned it but it would have had no ease and looked not right for a blouse. And navy blue is not really one of my top colors to wear, it seems so utilitarian to me, not fun in any way. So it is always the background basic in my wardrobe. But I did receive a new sweater as a Christmas present, and this silk blouse is perfect with that. 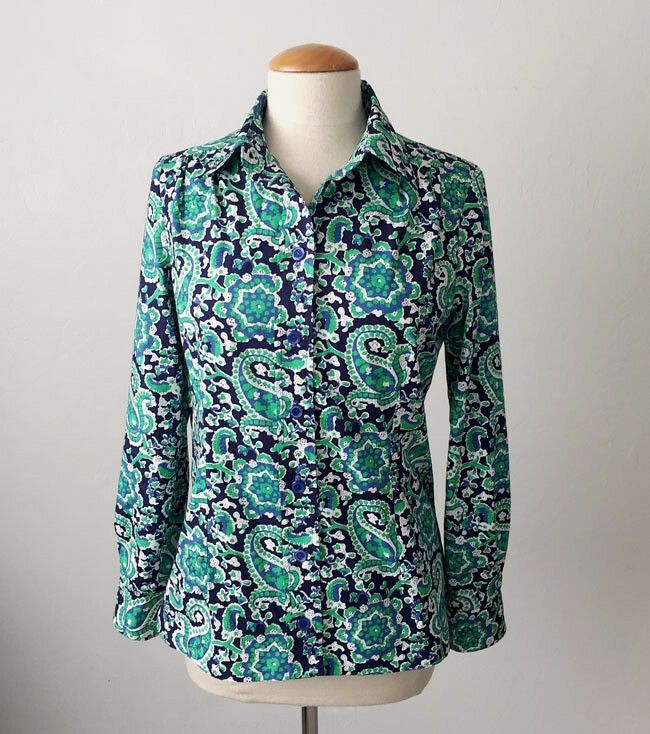 I saw this blouse pattern today on the BurdaStyle website so if you want it and don't subscribe there it is. This week I'm sewing like mad on a deadline to complete a cocktail dress for my friend Heather and the Hemisferic coat for her daughter. As of tonight the dress is all stitched together, needs a final fit check and then I will add the lining. The coat is all downhill from here, just need to sew on the buttons, do the hem and a few other details. The hidden buttonhole placket has turned out really well although I do cause myself more work as I kind of wing it as I go, instead of creating patterns for everything. And then I am going to take a bit of a break - I've been sewing non-stop for 5 days (being sick really messed up my schedule) and I need to take a look outside, pull some weeds and generally get organized for spring! Today's garden photo, a pale pink camellia. 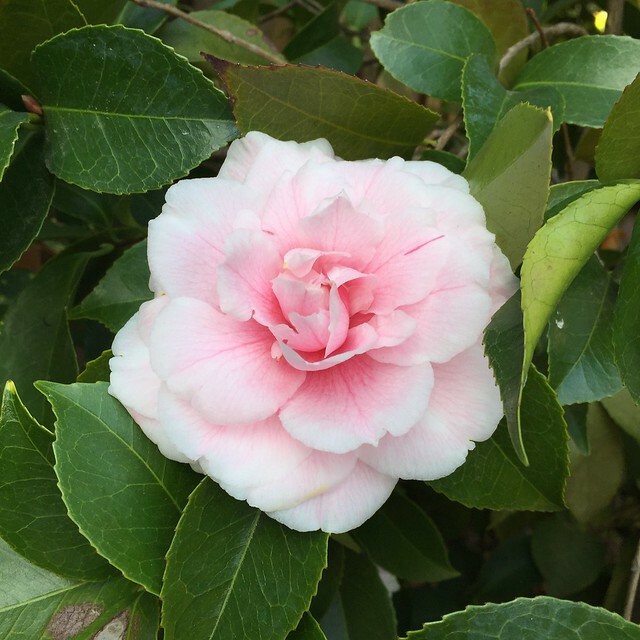 I have such mixed feelings about camellias. So many gardens around here have what are probably very old bushes. They seem to have gone out of style, garden-wise, but they are often quite large and established. The flowers are pretty but they only bloom for a few weeks and are so messy. But they add a lot of greenery and are tough, I like that in a plant. Hello and how are you? It seems like a good day to write a Random Threads post since that is about as much energy as I can muster today. Whatever bug is going around has landed on me this weekend, so I am mostly laying on the couch, listening to podcasts and snoozing. It's so annoying to get sick, especially as I have so many other things I would rather be doing. Although I have accomplished a clean up of my desk and started a folder for tax stuff that is starting to arrive in the mail so I call that a win! Finishing up a zillion projects that are in progress. 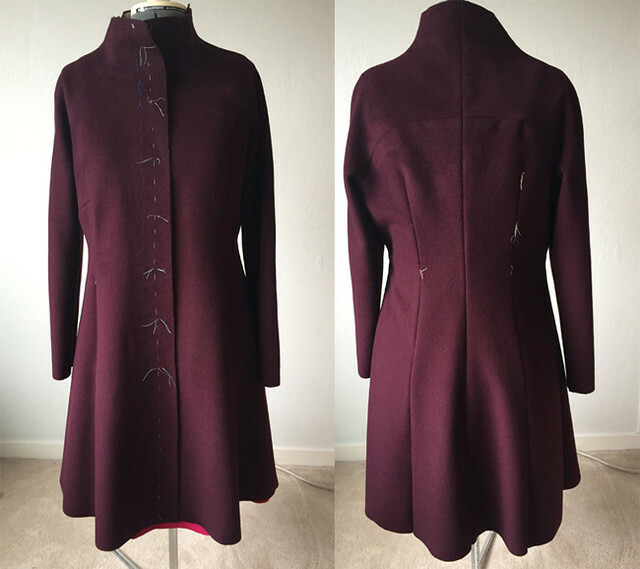 I am making the Hemisféric coat from Pauline Alice Patterns for my friend Heather's daughter, in a beautiful burgundy wool coating we found at Stone Mountain. Also making a dress for Heather from Burda. They have an event on Feb 3 for which both these things need to be finished - so it's a good thing I started a while ago. Here's a sneak peek at the coat. It looks a bit limp on the dress form and it partly basted together pending another fitting. Also I'm changing out the front zipper for a hidden button closure. I have tried it on myself as well, and it just might need some teardrop shape shoulder pads to keep the shaping of the shoulder seam just right. You can see that I never take out all my tailor's tack threads until I am done, once things are sewn up and with handling they start to fall out anyway. That is one thing I notice when I'm teaching sewing classes, everyone focuses on a different thing and some students are super fussy about stray threads, or some other detail that doesn't effect the task they are working on. 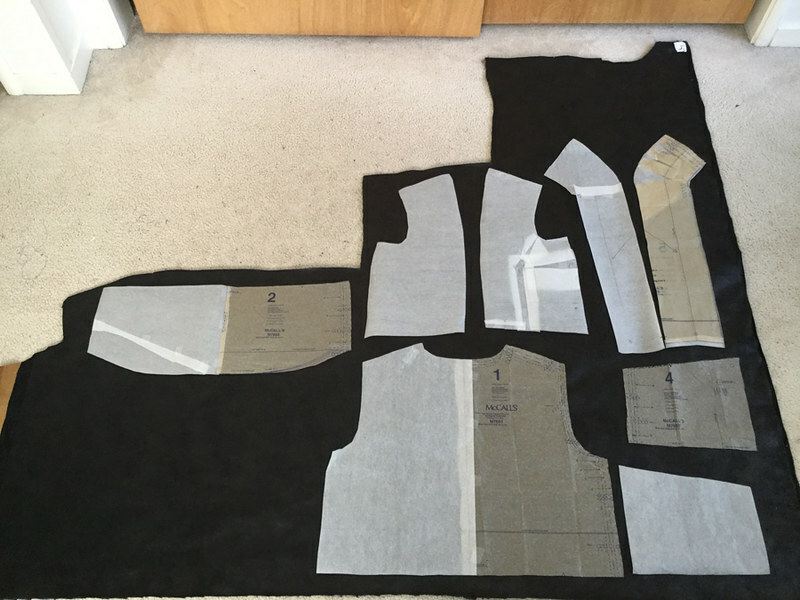 Wardrobe/Make 9/Sewing Planning: oh my, this is the time of the year when everyone commits to some challenge or other, or takes a deep dive into sewing planning. That just seems like way too much to think about, and while I do plan or schedule in some areas of my life, with sewing I just go where my mood and the fabric finds take me. I feel the same way about gardening - some general ideas in mind but nothing carved in stone, and who knows what gorgeous plant or design idea I will come across. 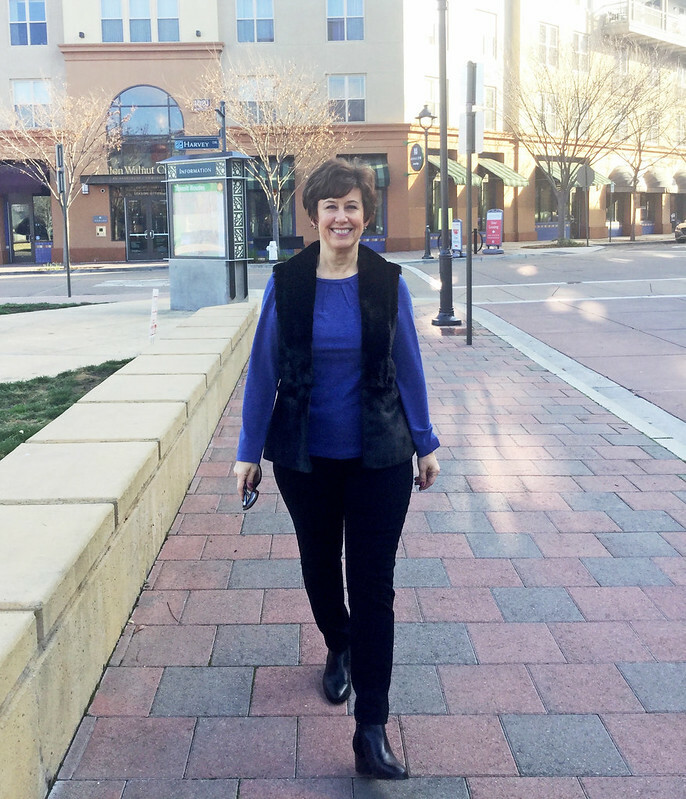 I find I get more accomplished riding a wave of new enthusiasm instead of trying to carry through on a concrete plan. So if I see a pattern I just must sew, well then I drop everything and do it. 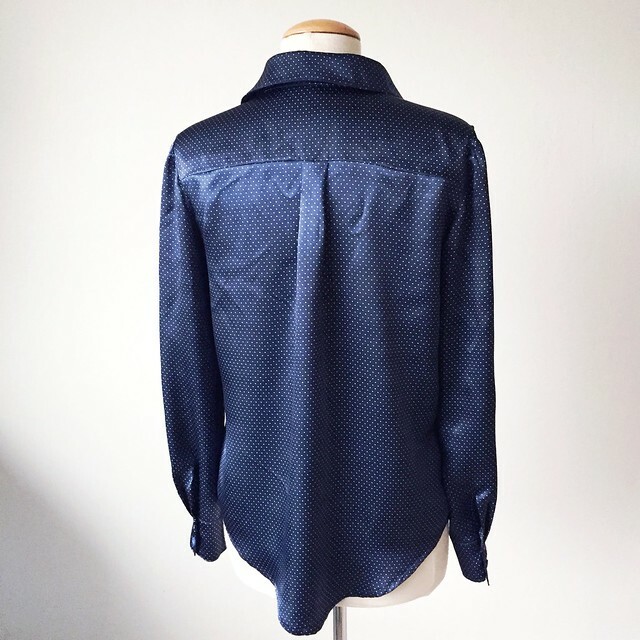 Reading lots of blogs and IG posts I am sure that making a sewing plan is helpful, particularly if you are trying to build a handmade wardrobe or have limited time and want to make the most of it. But no plan here - random sewing all the way. Pleated Pants: 😱 nooooooo! please don't tell me they are back. Perhaps some like the style but I think they rarely look good. I mean you can have a sophisticated trouser that is not a close or slim fit pant, but pleats, why why why....I have seen a couple of pairs in my new Burda mags and somewhere else, maybe an indie or Simplicity? anyway you will not see me sewing these up this year or any year. Burda Magazine: I'm quite glad I subscribed and wondering what took me so long. Although I will still be forever a fan of Vogue/McCalls/New Look and all the rest of the traditional American envelope style sewing patterns with their parchment colored tissue pattern paper and the light grey/dark grey instruction sheets. Partly that is familiarity but now that I've sewn with a lot of other pattern brands I think they are still really good (ok the best). Definitely you run across some quirks and instructions that are not easily understandable but I find that if you look at the diagram absolutely literally - to the point of placing your cut out pattern pieces with the pattern piece still attached near and at the same angle as shown in the instruction diagram, then walk your self through the maneuver they are diagramming you will find that it works. Speaking of Burda magazine, I just got my February issue in the mail and already have picked out my favorite from this issue. 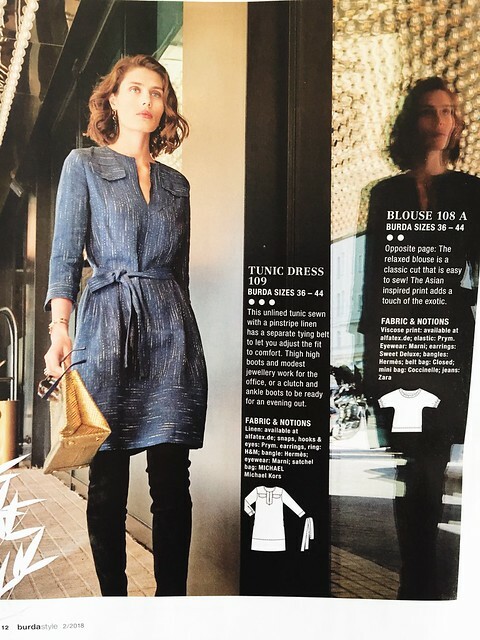 Tunic dress # 109. I might just have to find a similar fabric too. pattern love! Under the category of I just knew it: Did you see this dress on the Tessuti fabrics blog.Vogue 9237 (although their illustration is...not good) I love the summery style of so many things I see on their blog. But when I saw that blog post I said HA! 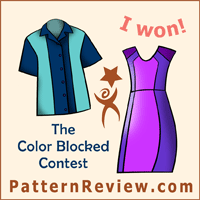 I knew that was a cute pattern and I included in a Pattern Whisperer post on loose-fit dresses last summer. And she did exactly what I would have done, which is to reshape the armhole in a more cutaway style, it looks more modern and less blocky that way. But so cute! now I have to get this pattern and try it out. I think fabric choice is key so this will take a bit of pondering. How many photos is too many? Is it just me or do you kind of laugh when you read a blog post and it has 20 photos. Of the same garment. On the same person. And they all look just about the same. I scroll faster and faster looking for information, thinking Ok already I see the dress/top/pants whatever on you and now I want to know some sewing details. (hey it's not a real Random Threads post if I don't get a bit cranky about one or two topics). 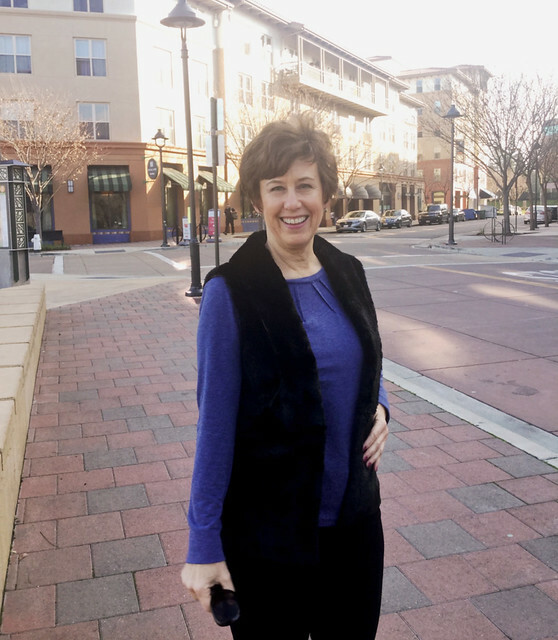 Cardigans: what is it about cardigans? Do you have a garment that you can't stand? I'm sure everyone has one type of garment that they just don't like and cardigans are it for me. They look nice on some people and I can see the utility, also a good way to complete an outfit but will never wear a cardigans. And now people are sewing them, eek. I bet if you think about it you have some type of garment which you don't like and will never wear. A wrap skirt? Peasant top? dirndl skirt? even one of my favorites - the blazer jacket is probably an anathema to some of you. Confess - what is the garment style you can't stand? Sleeve mania: Shows no signs of slowing down. Most of the new pattern releases have had tops and dresses with even more sleeve volume and variation that I could have predicted. 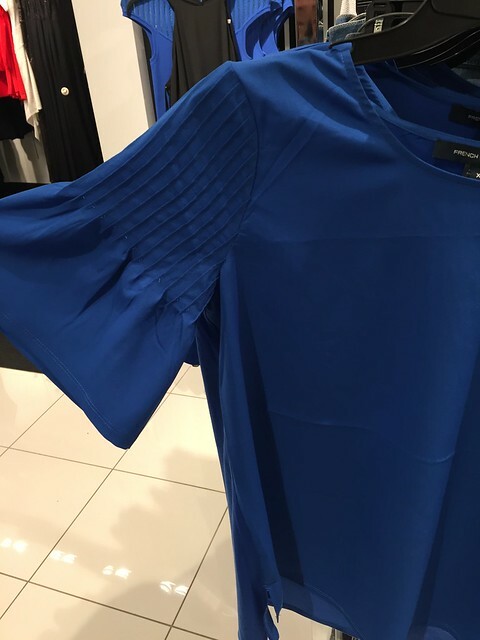 I saw this top in Macy's over the holidays and it is kind of interesting. To make it I think I would sew all the pin tucks in a piece of fabric and then cut out the sleeve. Might try it as I have not made anything with crazy sleeves yet. Mostly because I know they will bug me and I will regret it. But I will still probably try it out. Can't help myself. 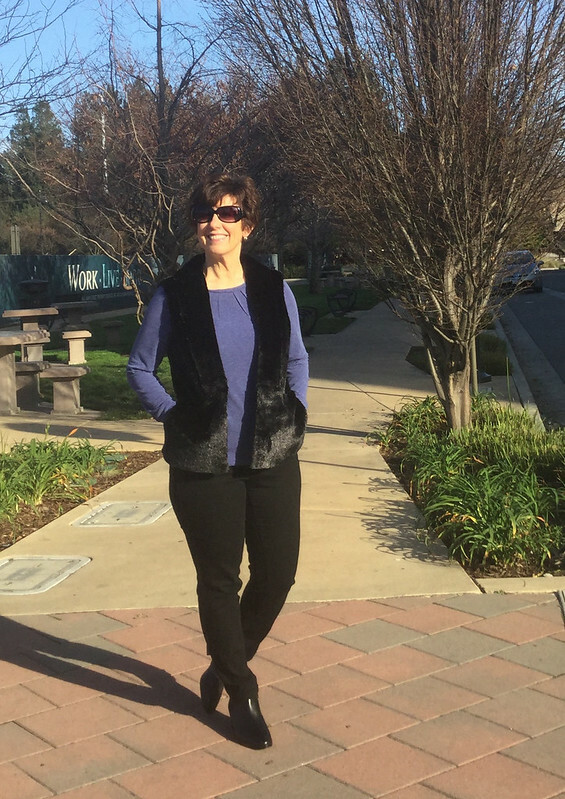 As for recently completed items, I've actually worn my faux fur vest a few times and I'm starting to like it more - so cozy. Next up I might get to that blue two-sided wool I bought at Mood over a year ago, I already finished the silk blouse which goes with it. And we have Frocktails coming up, with the Bay Area Sewists in a couple of weeks. Now I should have something in my closet already right? but you never know. I could wear my Aldaia dress although knowing me I will want something a bit warmer. 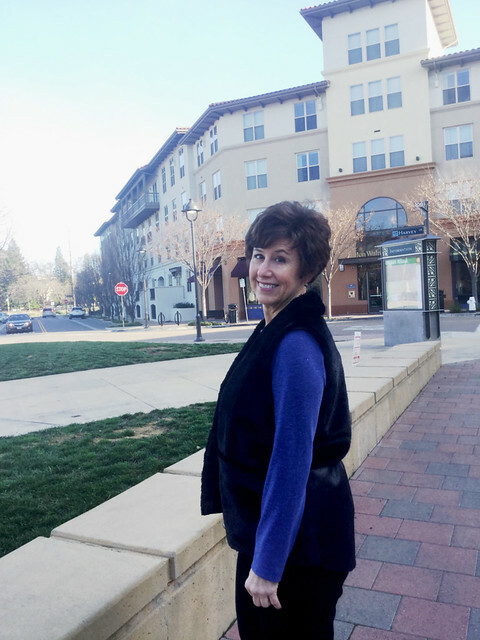 On another note I have to thank those of you who got all my Spinal Tap references in that Aldaia dress post and commented - sometimes I think of things to say in these blog posts but worry that people will think "what is she talking about?" Ok now I know at least some of you will get a laugh at my goofy references. What else is next? 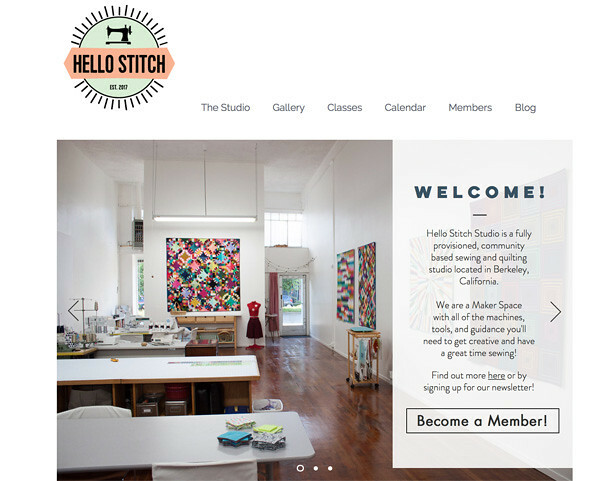 Planning for our spring classes at Hello Stitch Studio, the schedule should be on their website in the next week. I think we will have a dress class, garment copying, pattern fitting and some mini classes on specific skills. 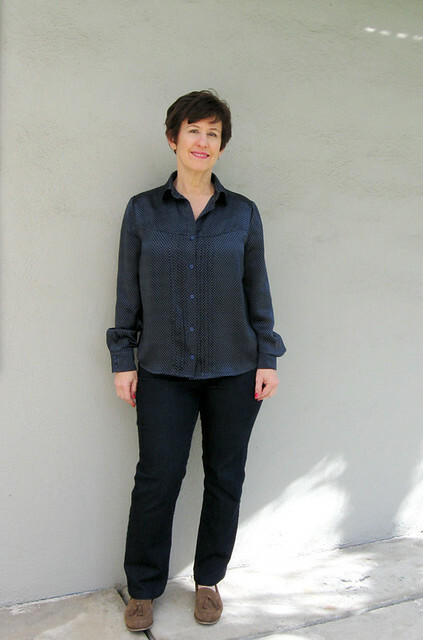 The February schedule is on line now and includes my new favorite class, Pattern Basics - How to Read a Sewing Pattern. Which is so much more than it sounds and even if you are have been sewing for a while it could be a good review. But perfect for someone just getting started or who has been away from sewing for a while. Stay warm and well everybody - spring is just around the corner. At least let's tell ourselves that, right? We can't complain here in N. California, although it would be great if we could have some more rain. 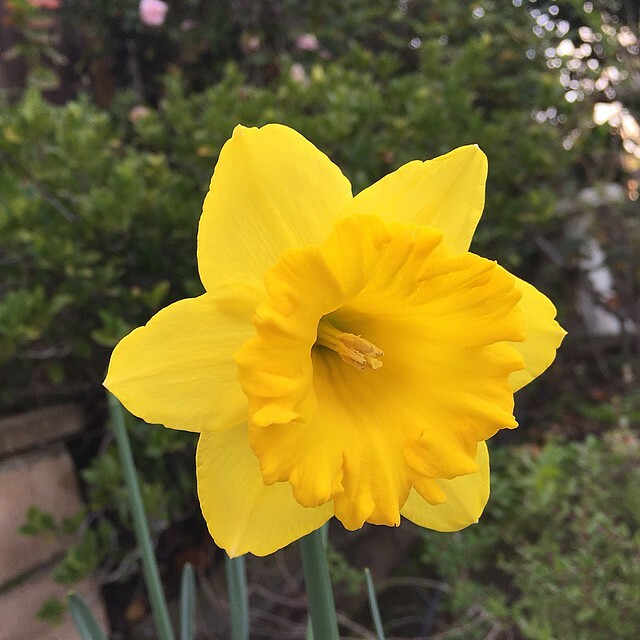 But the first daffodils are already blooming in my yard. Do you every make something completely on a whim? An item that is totally unnecessary - more than that, something that you think when will I even wear this? I find that is exactly what I have done, and spent far more time than reason would suggest to sew up this faux fur vest. Which like many things is difficult to photograph, keep scrolling for a better look. I mean, really? I blame Stone Mountain fabrics. In the best possible way 😊. One day I was there to get a specific color lining - or something very practical like that and just out of the corner of my eye I spied a bin filled with all kinds of interesting furry remnants. 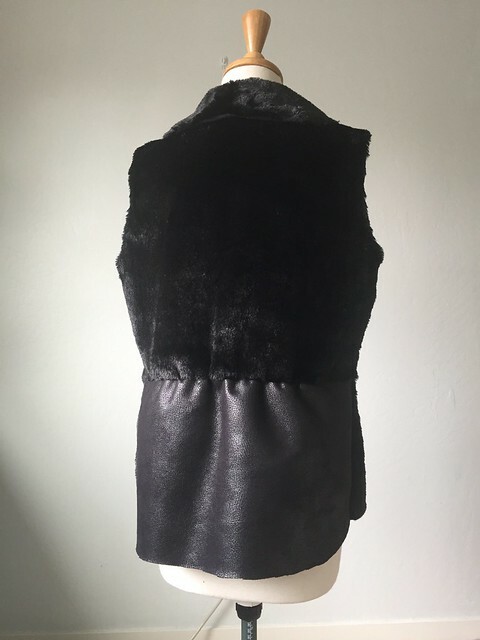 The first thing I pulled out was this one - which is a black faux fur on one side and a shimmery black faux leather on the other side. And the piece was $ 12. Madness overtook me and I bought it. Thinking maybe to use for collars or some such details. But no, the idea of a vest entered my mind and here we are. However the sewing was a saga. It seemed interminable!!! Perhaps because I wanted to retain that leather side, I decided to make it unlined. This seemed like a shortcut but no. More on that later. I wanted to use a simple pattern and I wanted it to have some kind of collar as my neck is always cold, so this pattern seemed like a good choice, as it was a vest and had an interesting collar. In the end I made it work but it was a long way to get there. 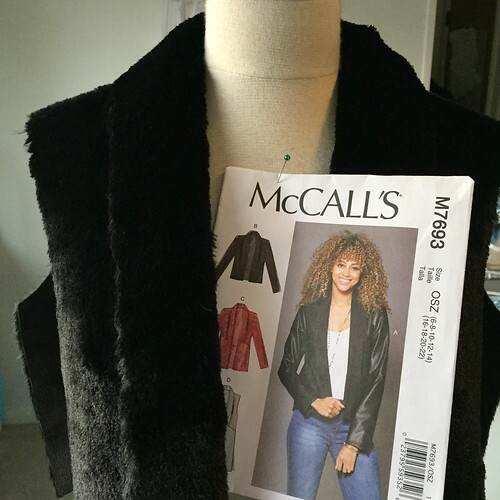 McCalls 7693 is the pattern I used. First up - a little pattern alteration. I realized that the collar piece is cut on the bias. But my fabric had no give at all, behaved like leather, so I had to create a rounded back neck section to do with shape what a bias pattern piece could do. I did a small adjustment on the front to lengthen, and then copied all the pattern pieces so I could cut everything at once instead of flipping or cutting two layers which with this odd remnant was not possible. 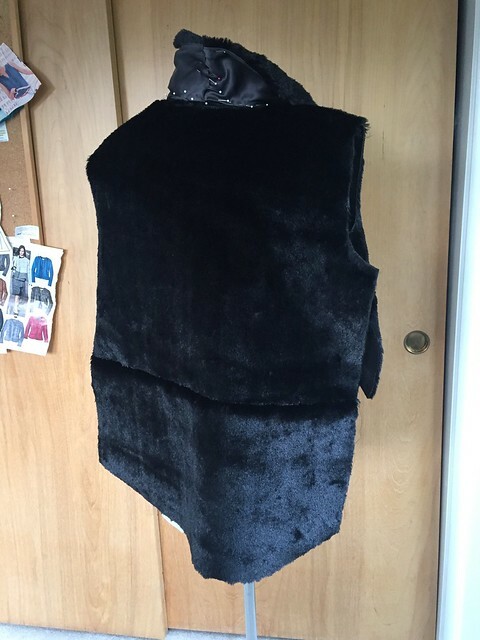 Here is the layout, I cut with the fur facing down, and still have some sizable chunks remaining for future luxurious embellishments on yet to be imagined projects. And to think I wasn't going to include pockets. Good thing I came to my senses during the construction because now they seem absolutely necessary. Back to sewing. Here it is completed. This neat and tidy photo does not indicate the amount of fuzz that I have recently endured in my sewing space. And on whatever I'm wearing. And find in every room of the house. I finally came up with a technique which can be referred to as shake the heck out of it and let rain all those little hairs until every pattern piece had shed its fuzzy edges and was relatively safe to handle. Details of the sewing conundrum. Since I decided not to line it, then the collar needed some kind of finish on the underside. So the collar was lined and I flipped the seam to the underside of the shawl, so it is actually clean finished on the inside of the neckline and then covered by the lining under collar. Hard to explain but if you sew this pattern it would make sense. 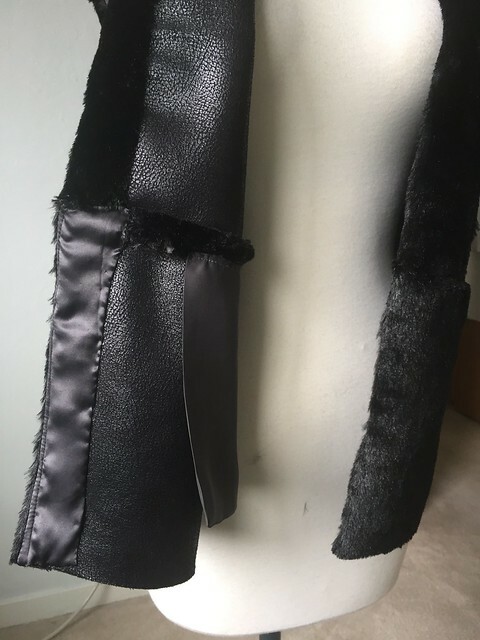 This photo below shows the shawl collar with the lining, which is machine stitched at the outer edge, and then hand stitched to the vest where all the pins are. It gave a tidy finish and I got through a few movies while sitting and stitching. Note the two piece back. 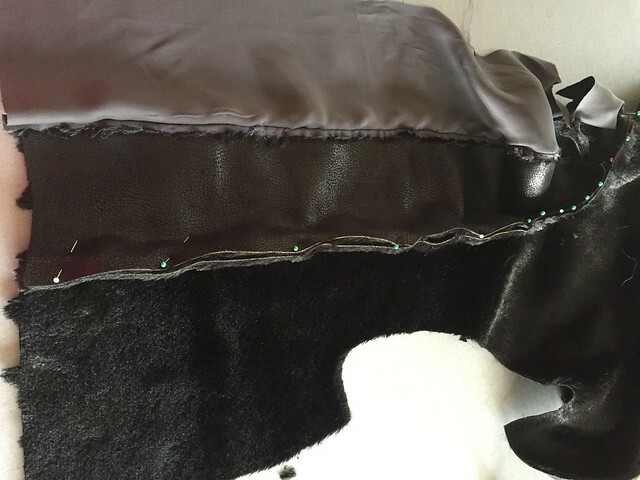 After I was putting it together, I was really sorry that I cut it in two pieces, because the seam did nothing for the fur look, and just made it stiff. But as always, a few hours of dress form time gave me an idea, so I flipped the bottom piece so the leather was on the outside. And to me much better. 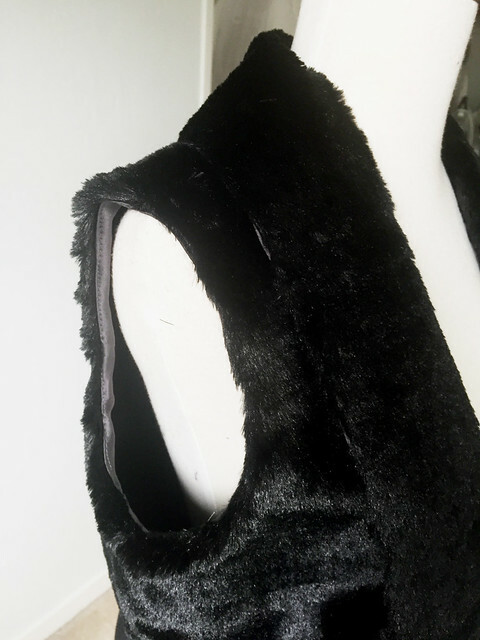 Also the pattern has no shaping, and in a fabric this might work but the stiffness of the faux fur/leather made it look like a barrel in the back. So I put elastic in the back and it gives it some nice shaping and interest. I think it makes it look more like real leather. Back to hand sewing. Call me crazy but I didn't like how the seam allowances behaved once it was stitched together, so I hand stitched every one flat. And in the case of the collar I hand stitched them down before enclosing with the collar lining. Which is a scrap of charcoal grey silk charmeuse I found in my lining scrap bin. Despite all the hand sewing, the actual machine sewing was a breeze. No special treatment - no walking foot, used pins, regular 80 universal needle. The armholes are also bound with the silk charmeuse. All in all I'm very satisfied with the way the collar turned out, it feels great and has the right amount of shaping for a nice shawl collar. The last spot that I had to do a bit of improvising was at the center front sections below the waist seam. In the end I decided to finish them off with more silk and then leave the bottom end raw. 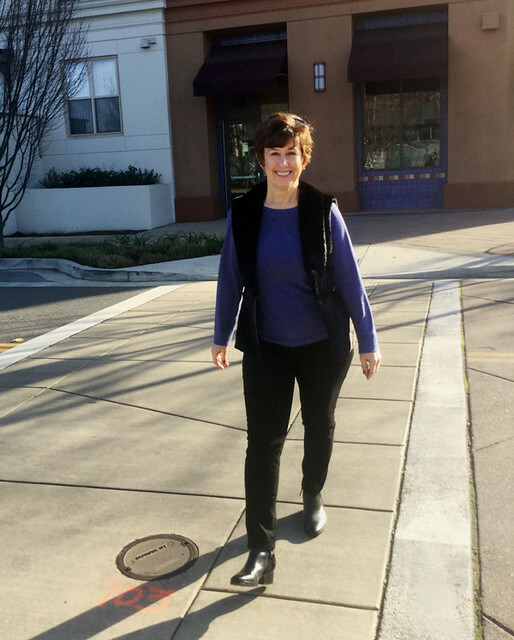 The pockets are attached to the waist seam so they won't peek out below the hem edge. I really like the leather side and wish I could have figured out a way to use more of it. Every once in a while it's nice to sew something completely wacky, just to stretch the creative muscles. And astound your friends by declaring that you made it. 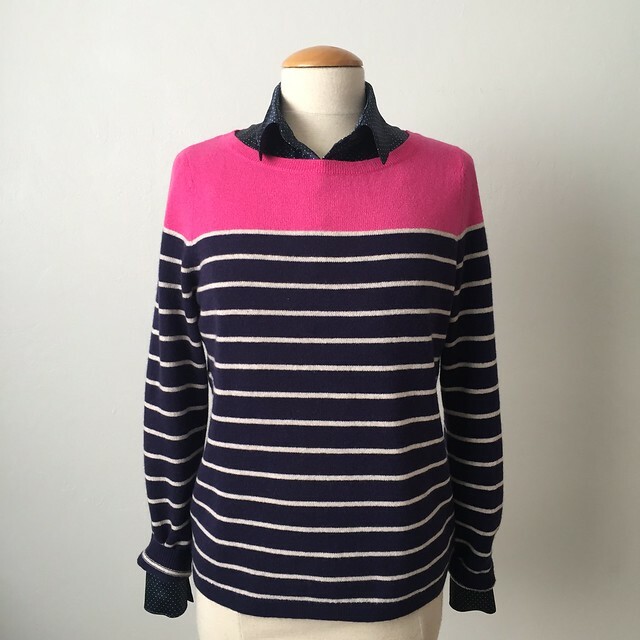 By the way, at Hello Stitch Studio in February we have the Copy A Garment class again so if you have a beloved item that is getting past it's prime - clone it! My next blog post should be my copied pants which I am really happy and plan to make pants in any color that strikes my fancy. Other classes are listed on their website, and if you have a particular class. specific garment or pattern you would like to do in a class please let me know - we're open to any class ideas. Happy New Year! Thinking about what I sewed this year, and looking for some theme I realized that as usual I went where my mood and new fabric purchases took me. I am not much of a planner however I did kind of tell myself that I would try to resist the temptation to sew any new coats and jacket. To my surprise I mostly succeeded with that idea. After all I have so many already! In fact on Christmas eve I put on my tricolor coat to go to mass, and that was the first time I had worn it this season. So I'm glad to give sewing coats a rest, although I did make some for other people. 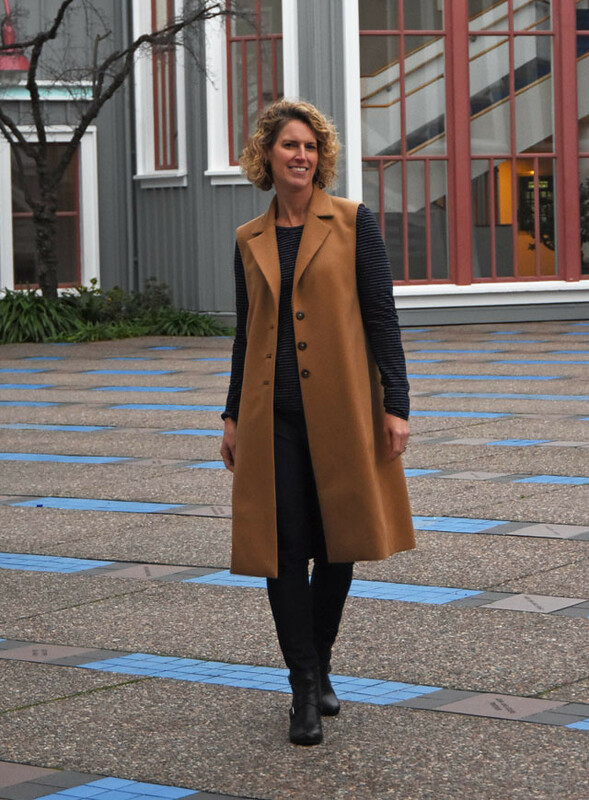 In fact - one of my best items of the year might have been one of the earliest projects, a camel colored cashmere long vest which I sewed for my friend Alice. She bought the fabric in NY at Metro Textiles the previous October. Although I always want to call it a sleeveless coat - which I suppose is a vest. Anyway - here's the post with pattern details. 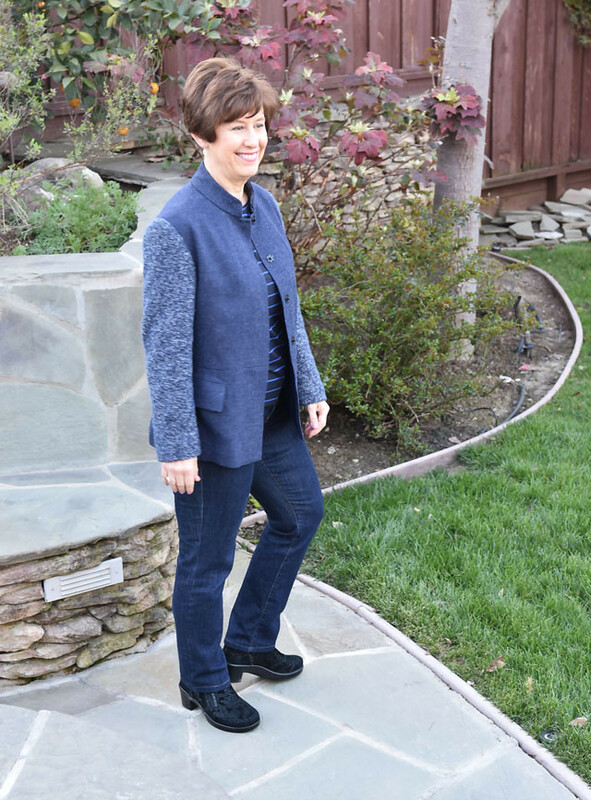 I did sneak one jacket in for myself, which was this blue wool jacket sewn using a Vogue pattern that is about 16 years. Not quite vintage but not new. There are a lot of really great Vogue designer patterns published in the 90's and 2000's. Partly because I was doing some specific construction technique posts for Craftsy, but mostly as practice in order to teach at Hello Stitch Studio which opened in May in Berkeley. It's a great space for sewing and classes, the light is beautiful and those big cutting tables are fantastic. We have all kinds of classes scheduled for January and February so if you are in the area check it out. Or even if you are from outside the area and are coming to N. Cal - plenty of airbnb's nearby if you want to make a weekend of it. We have upcoming classes in on knit t-shirts, button front shirts, and I believe we have a space open in this weekend's coat making workshop. 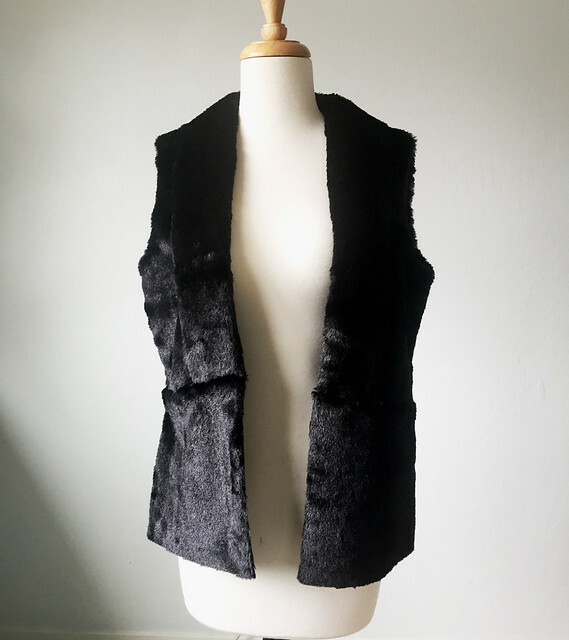 If you have piece of wool in your stash that needs to get off the shelf and onto the cutting table to be a new winter coat or jacket here's the link. Also I wrote a LOT of posts for the Craftsy sewing blog this year, and have created a page here on this blog with links to all of them. One pictured below is how to attach a shirt collar, two different ways. 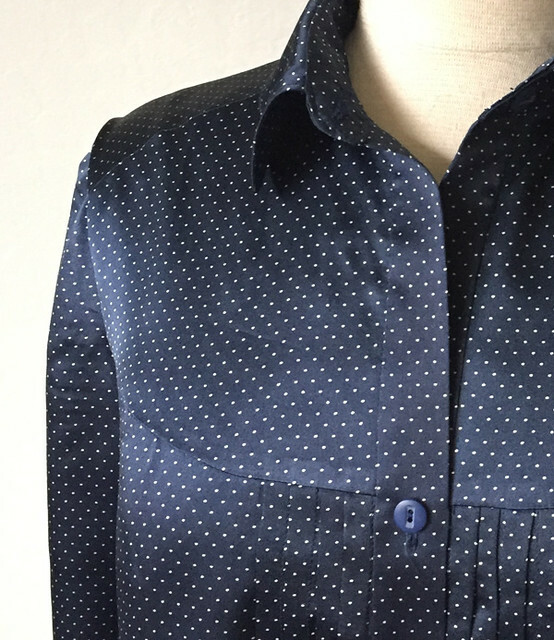 I think the most popular post I had on the Craftsy sewing blog this year is this post on how to change the neckline for knit top patterns. As evidenced by my quick analysis of my own sewing, I made a lot of knit tops, woven tops, a few items in other categories, and a few dresses. 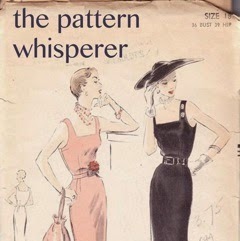 That's another category where I have too many - but how difficult is it to resist the siren call of a cute dress pattern? So speaking of dresses, my absolute favorite dress that I made this year has to be the embroidered denim shift dress. Denim! flowers! sleeveless! all my favorite things in one dress. When I saw this fabric at Stone Mountain I jumped up and down with glee. And I wore it so much. And will do next summer and the one after that. 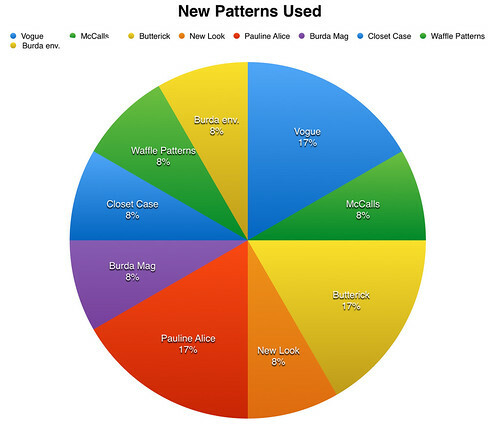 What about new patterns? As per usual I tend to want to sew some new patterns but then usually decide I can make just what I have in mind with a pattern I already have. However I did use more new patterns this year than I have in a while, including Waffle, Closet Case, and my European favorite, Pauline Alice Patterns. 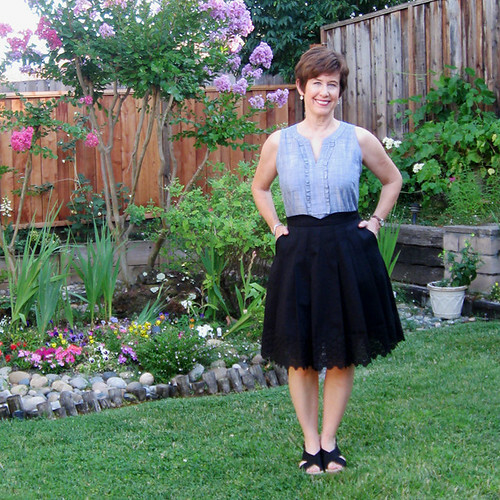 Including testing Pauline's new summer pattern, the Mirambel skirt, which turned out to be the summer skirt I didn't know I needed! (worn with my sparkly chambray top, fabric for that from Stone Mountain). 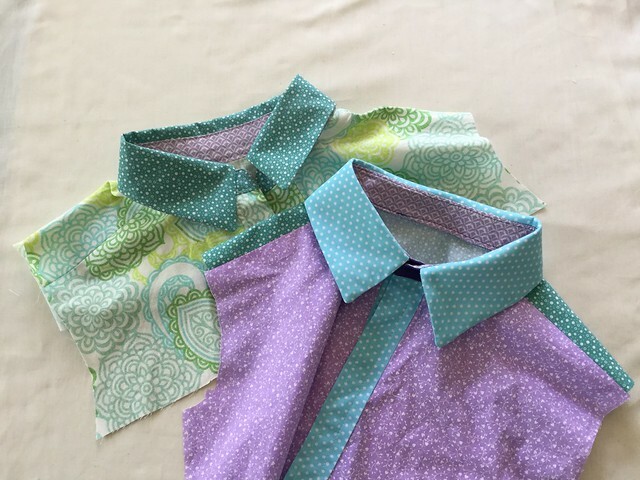 July was a good sewing month - 3 items sewn that are among my favorites. 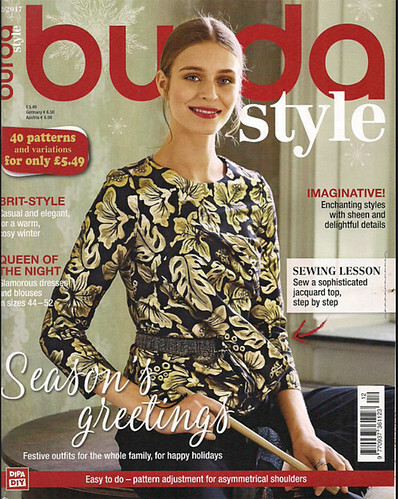 One other development in the category of patterns is that I finally subscribed to BurdaStyle Pattern magazine. And I've already made one top, with plans to make another item from this issue. 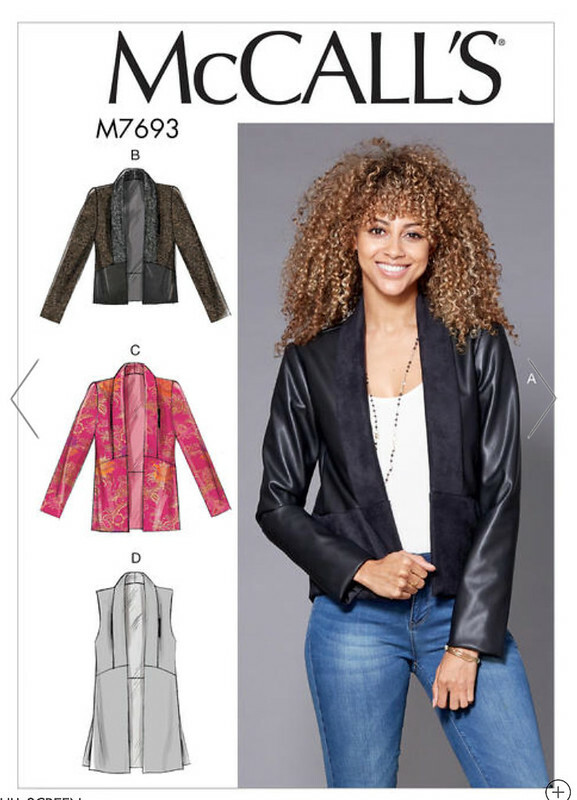 (Jacket # 118). Actually I tried it for a 3-month subscription, and even if I don't use it much I enjoy getting the issue in the mail and sitting down for a read-through. But I'll use it. Thank you to everyone for all your wonderful comments throughout the year. 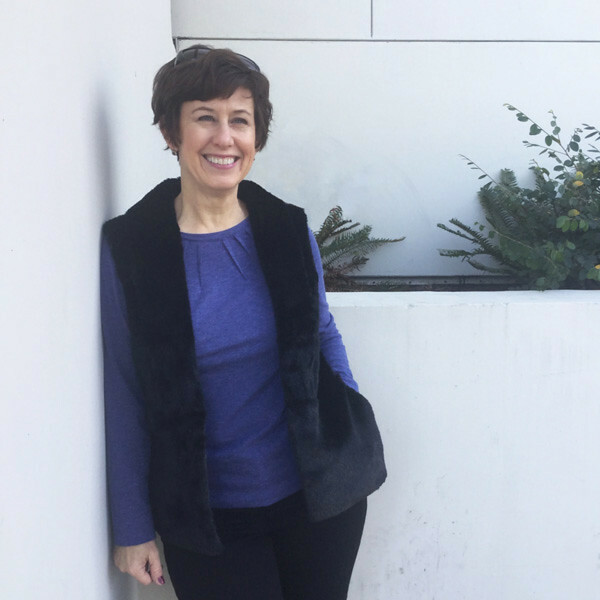 I say it every year, but I will always be grateful that writing this blog has given me the opportunity to get to know people from all around the world that are as crazy about sewing as I am. 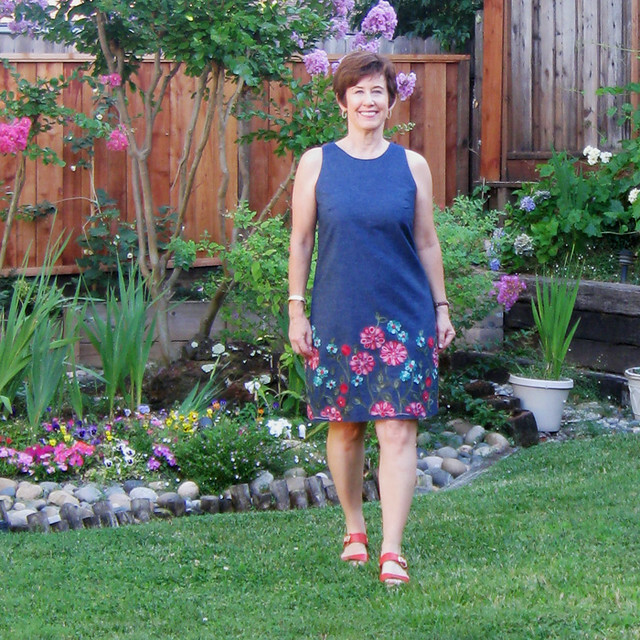 Socializing, trading patterns, and getting out of the sewing room to meet new sewing friends is the very best part of this blog.